The Social Economic Debates accepts only the papers in English language. Articles previously published, those under consideration by another journal, and those with a pre-existing copyright may not be submitted. Authors must ensure that at least half of the paper contents or core idea has not been published anywhere else. In other words authors should prove the considerable adjustment made and value added in their submissions. Neither the Editorial Board pays for unsolicited materials. The Editorial Board reserves the right to minor editorial corrections like abbreviations or changes in titles and sub-titles. Any requests to add or to remove a co-author, to rearrange the co-author names must be sent to Social Economic Debates by the Corresponding Author before the final acceptance by the Editorial Board. The eventual request must contain the explanation of the request together with the scanned confirmation signed by all of the co-authors. Corresponding author fills in the Online Submission form. The Editorial Board of Social Economic Debates recognizes the phenomena of �ghostwriting� and �guest authorship� as the serious scientific misconduct. Moreover, the eventual financial support of any research institution or other entity to the paper creation needed to be revealed in the article acknowledgments �financial disclosure�. Therefore the Corresponding author must fill in and sign the Statement of Originality (in case there are two authors or more) which should be submitted together with manuscript using the Online Submission form. All detected cases of scientific misconduct will be documented and the appropriate institutions and entities will be notified. Ghostwriting � a substantial contribution to publication has been made, without revealing author�s participation, or without being mentioned in the acknowledgments enclosed to the paper. Guest authorship (honorary authorship) � the author�s contribution is insignificant, despite of declaration. The Editorial Board members make initial screening of the submissions and inform the authors if the papers are adequate for the journal. After this initial acceptance the reviewing process starts. Each paper receives a registration number. All of the contributions of the Social Economic Debates are subject to a double-blind per-review, which means that neither the author(s) nor the reviewers know the identity of the other. 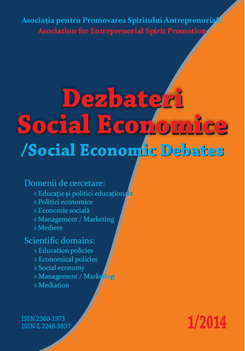 The list of reviewers is published on the Social Economic Debates website once a year, without assigning the reviewers names to a particular article. Every submitted paper is reviewed by at least two independent reviewers (outside of the authors� affiliated entity). Additionally, at least one of the reviewers is affiliated with a foreign institution relative to the nationality of the author(s). The reviews are in written form and contain a clear referee� statements concerning paper�s publishing approval or its rejection. In case of minor revisions the article is send to the author(s) together with referees� opinions. The authors are asked to respond the referees� comments and make the appropriate adjustments in the text. Then, the authors send back the corrected version. Step 1: Submission of two files using the Online Submission Form: a typescript and the Statement of Originality. Step 4: The response to the reviews and eventual article corrections made by author(s). Step 5: The final decision of Editorial Board. Please read the following guidelines and use the Social Economic Debates article_template for submission of your paper since only articles formatted accordingly may be accepted. The name of the file must comprise the name of the first author (e.g. monica_iliescu.doc). Full names should be provided. Please indicate affiliations of the authors. Indicate the authors� affiliation addresses below the names. A concise abstract should briefly state the purpose of the research and the main results. An abstract must be presented in English and separate from the article (length of abstract: 200-220 words). Provide at least one standard JEL code and up to 5 additional keywords. Papers must provide an introduction, overview of the literature, present the research methodology, results analysis and describe the contribution of paper (conclusions). Recommended length of paper: 6-12 pages. References to publications should be as follows: �Maslow (1992) noted that�� or �This problem has been studied previously (e.g., Smith et al., 1969)�. The author should make sure that there is a strict one-to-one correspondence between the names and years in the text and those on the list. The list of references should appear at the end of the main text. It should be double spaced and listed in alphabetical order by author�s name. Hamilton, J., King, R., 2006. The Economic Impacts of Financial Liberalization: Evidence from the Capital Markets, North-Holland, Amsterdam. Mayer, T., Meltzer, H., 1999. �Money supply�, in: Friedman, B.M., Hahn, F.H. (Eds. ), Handbook of Monetary Economics�, Vol. 1. North-Holland, Amsterdam, pp. 357-396. Griffiths, W., Judge, G., 1992. �Testing and estimating location vectors when the error covariance matrix is unknown�, Journal of Econometrics, Vol. 54, pp.121-138. ECB, 2004, �Labor productivity developments in the euro area: Aggregate trends and sectoral patterns�, ECB Monthly Bulletin, July. Mankiw, G., 2010. The Simpson-Bowles social security plan, �Greg Mankiw�s Blog�, http://gregmankiw.blogspot.com/2010/11/bowles-simpson-social-security-reform.html, accessed on 30th Nov. 2010.